The McCulley Cabin is a private home located in beautiful Paradise Valley Montana. 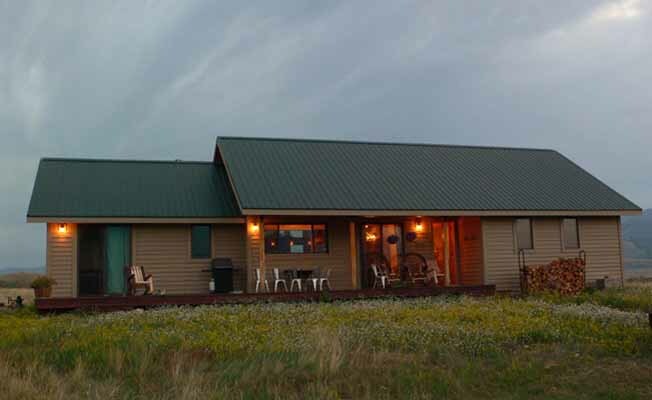 Sited on 20 acres near the Yellowstone River just 25 miles south of Livingston the location is ideal for year-round access to explore Yellowstone National Park as well as nearby rivers, mountain ranges, and national forests. This is no ordinary rustic rental cabinit is a luxuriously appointed home with high ceilings, a large great room and kitchen, 2 bedrooms (one with king bed, one with 2 full beds), an entertainment room with a sleeper sofa, fully equiped kitchen, 2.5 bathrooms, laundry, and 2 outside decks. Large windows in every room provide views of Emigrant Peak and the Absarokee-Beartooth Mountains. In the winter, radiant floor heat allows you to stroll around the house in bare feet while it's snowing and below zero outdoors.